Cyclo DOT 3 Brake Fluid is made from a super heavy duty formula that resists oxidation, corrosion and protects rubber seals. It is compatible in vehicles where DOT 3 brake fluid is recommended by the manufacturer. It has a high temp formula 450 F (232 C) minimum dry boiling point. 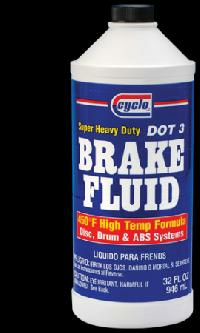 It mixes with all DOT 3 brake fluids and is formulated for disc and drum brakes. Aj Chemical Lubricants & Equipment..
Chemical Auto Supply Domain Co.